alaTest ha recogido y analizado 129 comentarios relacionados al producto Kodak T820 8X21. En promedio, la calificación para este producto es 4.1/5, al ser comparado con la calificación 4.2/5 de otros productos en la categoria Binoculares. Analizamos las valoraciones de los usuarios y los expertos, la edad del producto y demás factores. Comparado con otros Binoculares el Kodak T820 8X21 recibe una alaScore™ global de 89/100 = calidad muy buena. Strong lenses, for the price it is much better than anticipated. Bought to go to a football match & although we had good seats , used the binoculars to see more & found them great for the price I paid, nice & small to fit in a bag ,would definitely recommend them . They are easy to use small binoculars. They feel good quality for the price. We used them for a theatre trip where we were in the heavens and they were extremely useful. Could do with more dioptre adjustment to balance eyes. Otherwise very serviceable. Not top end by any means, but cheap and adequate. Needed binoculars in a hurry. These had good enough rating despite their low price. Everything about them was good - not brilliant, but good. Great price such that I don't mind the kids playing with them. One bad thing - the plastic smelled awful. 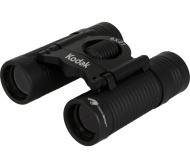 Brilliant little pair of binoculars - easy to carry around and does the job well for what I needed them for.